Somewhere this summer we lost our way. Under the banner of our First Amendment Right to Free Speech, we became boorish, angry, disrespectful fools. Rather than disagree with the policies of our President with either convincing rhetoric or a better plan, we resorted to calling him a socialist, accusing him of being born in another country, of promoting granny-killing death panels. I suppose we can understand the spewing of hate-filled trash talk by Rush Limbaugh, Glenn Beck, and Sarah Palin because they have learned that there is a positive correlation between the stratospheric rise in their ratings and the amount of hate speech they generate. So perhaps we can excuse them because they are simply feeding the monster, the more they scream, the more money they make. If they didn't have an audience their rants would quickly dissipate until they found a line of conversation that was more appealing to their audience. We have, however, crossed a line in civil discourse when our elected officials on both sides of the aisle use name-calling and the perpetuation of scurrilous rumor as an excuse to accomplish absolutely nothing while they are in office. Case in point: Joe Wilson, in what looked like an alcohol fueled "Watch me, boys!" outburst, yelled out "You Lie!" during President Obama's speech on health care. That he must have felt a coward's shame became evident when he high-tailed it out of the room as soon as the speech was ended. And yes, I do believe Joe Wilson is a coward as well as an ill-mannered boor who by his action does not deserve to represent the people of South Carolina. The irony is that while this outburst initially meant a cool million in the coffers the Democrat opponent he faces in a close upcoming race, it eventually caught traction with his fellow Republicans, boosting his own election war chest and quickly becoming the war cry of protesters in last weekend's march on Washington. Apparently it is now cool to not only call our President a socialist, but also a liar. It makes me long for the day when we showed respect for our leaders, even when we vehemently disagreed with them. Somewhere along the way, we as a society have silently agreed that it is okay for our public figures to steal the spotlight like jealous children at a birthday party. Rather than wait their turn, or compose a measured reply that is worthy of argument, we allow our television and radio airwaves to be filled with the angry, mindless, babble of the 'look at me' crowd, who excel not in providing answers, but simply in name-calling. Last night we witnessed another such example of thoughtless self-promotion, as Kanye West interrupted Taylor Swift's acceptance speech at the VMA's in a stunning display of poor sportsmanship. Apart from promoting himself by making a spectacle, I wonder at Kanye's real intention. This type of behavior has nothing to do with free speech, our right to express a dissenting opinion, or being cutting edge. It has everything to do with our growing callousness toward those with whom we share the world's stage, figuratively and literally. 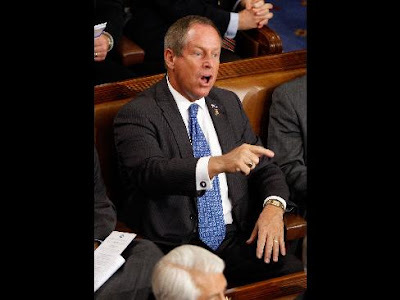 Was Joe Wilson expressing an inarticulate rage at the President's health care plan, showing his disregard for the office of the President of the United States, or angling for attention as he wages a battle for his seat in a close South Carolina race? Should I not be surprised that Kanye West is on Jay Leno's premiere tonight? Was Kanye simply giving us all another reason to tune in? That would be really cynical, wouldn't it. Kanye made his real intentions crystal clear in the original apology he made on his blog. He believes that Taylor Swift just won because she was white. Strangely enough the only person being racist here is him. I couldn't agree more. Kanye may have had ulterior motives, but it honestly looked like he'd gone off the deep end. What a great post. Regardless of whether one disagrees or agrees with the President, civility has been observed in a joint session of Congress during a presidential address. There might be much rolling of eyes,sighing, and even groaning but never before had anyone shouted at the President of the United States. Even if you don't respect the person holding the office, you still respect the office. I think this rudeness both in politics and in pop culture is really sad.